Everyone wants a pie of Indian eCommerce now-a-days and some want it more that others. After making his first investment in Indian eCommerce space through Snapdeal, the former chairman of salt-to-steel Tata group, Ratan Tata has now made his second investment in India eCommerce. Ratan Tata has personally invested undisclosed amount in Indian e-jewellery company BlueStone Jewellery and Lifestyle Pvt. Ltd. according to a ToI report. Bluestone was founded in 2011 by IIT graduate Gaurav Singh Kushwaha and Vidya Nataraj and seed-funded by the serial entrepreneurs Meena Ganesh and K Ganesh. Gaurav Kushwaha had previously founded Chakpak.com whose digital content was acquired by Flipkart.com. Vidya Nataraj on the other hand comes from family that owned retail chain Landmark stores. Prior to the investment from Ratan Tata, Bluestone has raised 2 rounds of funding – $5 million from Accel Partners in Jan 2012 and $10 million in March earlier this year from Kalaari Capital. Bangalore based Bluestone is probably the only Indian eCommerce company that has an end-to-end approach from manufacturing and designing themselves to selling the jewellery online. Ratan Tata’s investment may add lot more value to Bluestone rather than just the money he has put in. Tata Group owns one of the most popular jewellery brand Tanishq and it has grown into billion-dollar jewellery retailing enterprise under his watch. Speaking to Times of India, Bluestone founder, Gaurav Kushwaha said, “An investment by Ratan Tata who has been at the helm of India’s most successful and respected conglomerate is a validation of our approach in building an innovative brand that is disrupting the jewellery market”. While India’s organized Jewellery market is quite huge, estimated at $50 billion, online sales of Jewellery is still in it’s infancy accounting for less than 0.5 percent. 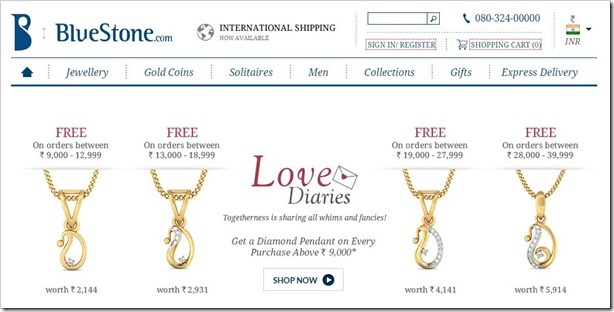 With Indian consumers increasingly buying more stuff online, e-jewellery presents a lucrative opportunity, which is also a high-ticket high-margin business. Bluestone has competition in e-jewellery business from likes of Caratlane.com who have till now raised around USD27 million in 3 rounds. Last year, they received funding to the tune of $15 million from Tiger Global. Bluestone is expected to have a turnover of around Rs. 60 crore this year. In comparison, their competitor Caratlane leads the market which is expected to around Rs. 150 crore.